When it comes to the Deluxe Hardware Table Collection from ECR4Kids, everyone will want to sit at the kids’ table! These childrens activity tables are perfect for art projects, games, or decadent lunchtime feasts. This collection of sturdy, kid-sized tables comes in two different heights — 18" and 22" — as well as a variety of shapes and sizes to accommodate use at school and home. Each table features an attractive natural finish that accentuates home play rooms and living rooms, as well as early learning environments such as preschools, kinderkartens and pre-k classrooms. Perfect size for young students to do coloring, studying and more, making them ideal for use as a childrens daycare table. 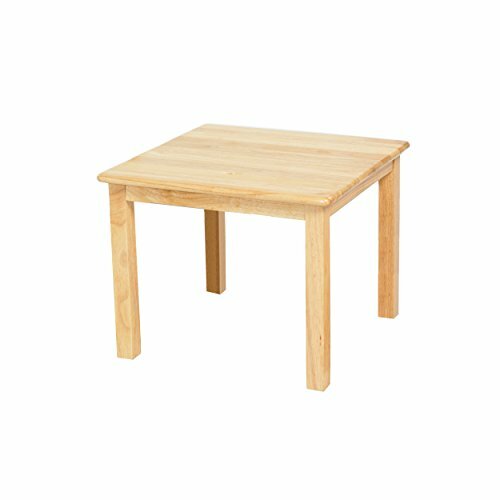 Hardwood tables feature a 0.75” bull-nose edge and sturdy 1.75” square legs. Pair with ECR4Kids Ladderback chairs for a matching hardwood childrens table and chairs set.